Welding Services: ASME, Aluminum, Stainless & More | Meyer Tool - Meyer Tool & Mfg. 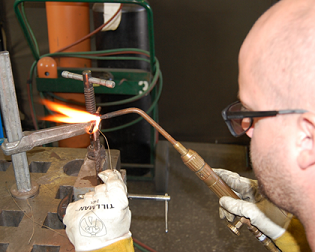 We have one of the most technically capable weld shops in the United States. Our welders are ASME Section VIII certified. We have experience welding a diverse array of materials including Stainless Steel, Carbon Steel, Aluminum, Titanium, Platinum, Hastelloy, Inconel, Monel, and Niobium. We specialize in advanced TIG welding of Stainless Steel and Aluminum with additional strengths in MIG welding, copper brazing, and soldering. ​Thin walled tube welding, Aluminum vacuum chamber weldments, and Aerospace grade WPS requirements are par for the course when it comes to a typical day in the Meyer Tool weld shop. Our welders are expert fabricators and blacksmiths capable of delivering jewelry store quality weldments whether it is on a one of a kind semiconductor process chamber or a production run of 100 ASME code pressure vessels. Quite a bit of extra work goes into completing projects that require ASME code certifications. The work starts at the front end when our engineering staff must work with our third party inspector to obtain an approved production design. 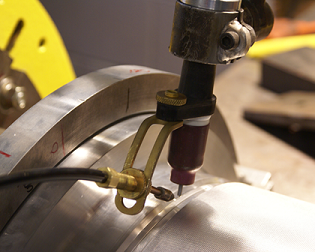 The production plan can sometimes include hold points for specific inspection criteria, NDT, or other testing. A weld map must be maintained so that every weld can be traced back to a specific welder. 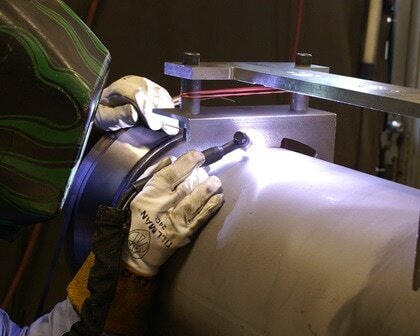 All of our welders must maintain certifications that document their qualification to weld on ASME code related vessels. 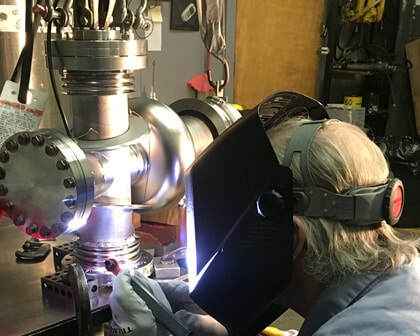 In addition to the weld map, our welders are trained to manage the heat log in order to ensure only certified and traceable material is used on ASME code related projects. It is easy to see the ASME code related components as they flow through the shop because ASME code material is always identified with bright red tags. The red tags identify the item number, purchase order number, item description and the material heat number. The heat number is also scribed on the part in case the tags are lost. Even though ASME code work often involves heftier welds it is not the welding itself that becomes the challenge. Maintaining discipline and adhering to strict procedural requirements is what allows ASME code work to flow smoothly through our shop. 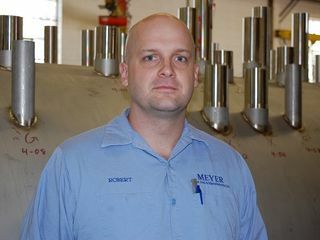 Bob has spent his career at Meyer Tool fabricating one of a kind precision weldments. Bob is an expert at reviewing weld designs, developing fixture plans, creating custom weld procedures, and troubleshooting complex fabrication problems. Contact Bob today for assistance with your latest prototype project or welding related issue. Aluminum is a very attractive material used on a wide variety of different vacuum chamber components and chambers. Aluminum is light weight and easily machined. Its reduced material strength relative to Stainless Steel does not usually pose a major issue and can easily be designed around. it also has low magnetic permeability properties which can be important on chambers where magnetic properties are a concern. Aluminum poses its own challenges when it comes to welding. Proper passivization and cleaning procedures are critical in order to reduce porosity, lack of fusion, and other common Aluminum welding defects. Meyer Tool has experience welding together a wide variety of different Aluminum chambers and components. Many of our Aluminum vessels have been put to use in aerospace and astronomy related projects because of its high strength to weight ratio. 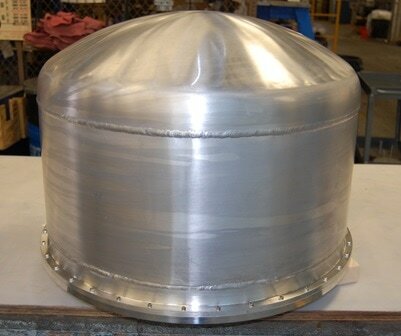 We have made pressure vessel for NASA and many different types of cryostats used on different telescope applications. Our welding staff have a number of tricks up their sleeves that allow us to take on some of the more challenging fabrication projects that other fabrication shops would pass by. 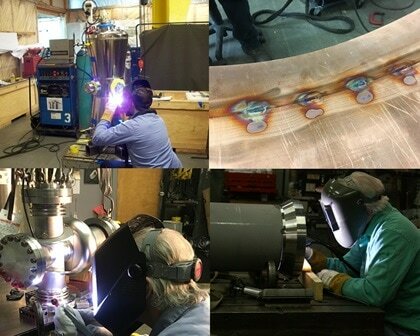 We have developed our skills welding on one of a kind high risk chambers and vessels that leave little room for error. We live in a world of tight location, circularity, perpendicularity, and parallelism call-outs. A bad weld in which distortion puts us out of tolerance can make or break a project deadline and cause days of extra machining or weeks of waiting for new certified material. A a result, we have developed procedures and developed our welding capabilities that allow us to consistently hit razor thin tolerances and maintain critical alignments. 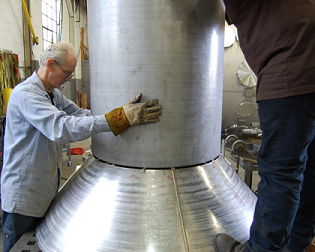 We have honed our TIG brazing procedures over the years by fabricating a wide variety of different copper heat shields and thermal shrouds for particle accelerator related projects. Copper shields are usually part of most cryogenic distribution box and cryostat designs. 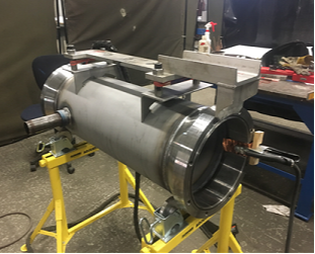 The thermal shields consist of a custom rolled copper shell with a winding array of copper tubing brazed to the surface. We also have extensive experience completing complex soldering operations. We have built an assortment of different cryogenic heat exchangers and cooling stations. 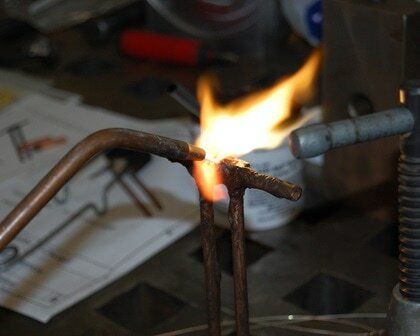 We frequently run into projects that require copper heat sinks soldered onto stainless steel tubing or shells in order to control heat transfer throughout the chamber.